John was born in Melbourne in 1943 and studied art at the Royal Institute of Technology. 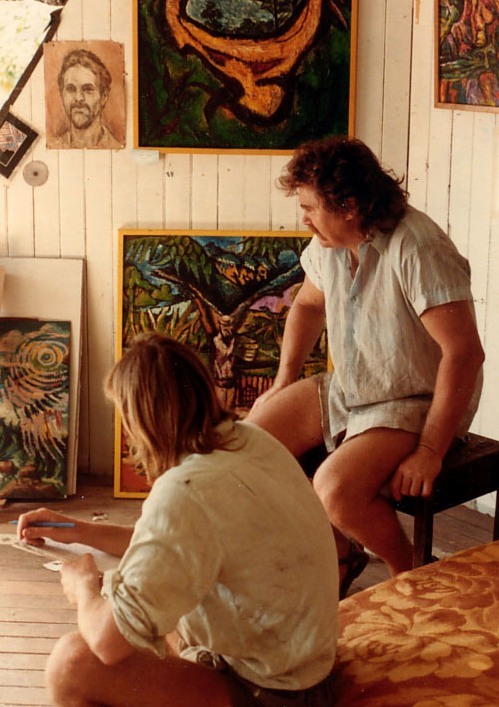 In about 1970 he moved to Cairns where he gained a reputation as a sign writer and painter. In 1973 he, his wife Sue, and a friend Arthur Norton, purchased a triangular block of land from the Ryker family at Cape Tribulation. About a year later John came to live on the land at what was then a very secluded location beyond the end of the Daintree to Cape Tribulation Road, as it then was. When John and Sue first moved in to their new home they had to bring their possessions by boat and across the beach. An old overgrown bulldozer track traversed through rainforest on his block and John used this to access a site on which to build his new home. He set about building a kitchen, as well as bedroom/studio in a gazebo, and a lookout over the beautiful Cape Tribulation and Coral Sea. Here he established his artworks, “Round-A-Bout Studios”, applying himself to painting surreal and abstract expressionist works, as well as some more representational figure work. In 1983 John’s seclusion was disturbed by the arrival of bulldozers when construction work began on the controversial Cape Tribulation to Bloomfield Road. John’s home at what was then the end of the Daintree to Cape Tribulation Road became the scene of confrontation, when forest activists, local and from afar, attempted to obstruct the work. John was arrested at the beginning of the protest, but it took a swarm of police to force his solid frame into the paddy wagon. Film of John resisting arrest went national and was one of the defining moments of the campaign to save Queensland’s lowland tropical rainforests. A selection of John’s work is presented here. The pictures, commissioned by Col Gibson, were taken by Tim Perry at Cape Tribulation in September 1984. It is intended to feature other works in the future, as they become available. John Paice on right and Colin Gibson in "The Gazebo" at the blockader site at Cape Tribulation September 1984. ©John Paice. No images can be reproduced without permission.